A view of the Pacific entrance to the Panama Canal and location of Panama's next "mega-port". One of China's major foreign and military policy goals is to establish a firm foothold in Latin America. Dawn's Early Light posted on this topic last April. China has a particular interest in the strategic Latin American country of Panama. While President Bush currently tours Latin America, the subject of a future DEL post, it is important to address China's growing influence in the Western Hemisphere. Cheat-SeekingMissiles has been posting on China's latest moves to acquire a former US Air Force Base that is being sold by the Panamanian Government (see C-SM "China's Panama Grab Threatens US", "More on Commies At The Canal" and "China Could Use Howard As Air Base"). The Chinese already own a major interest in port operations on the east and west sides of the canal. 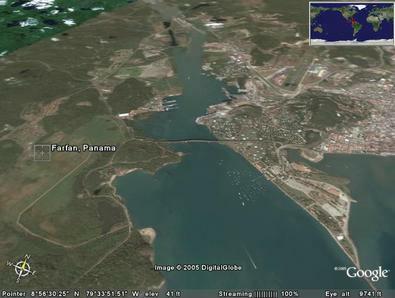 Panama has opened bids for a "mega-port" on the Pacific side of the Panama Canal (click on Google Map above) in Farfan. The port property is likely to fetch $600 million for the land and port rights. "[Panamanian President Martin] Torrijos met with representatives of China Ocean Shipping Co. (COSCO) of China; Evergreen of Taiwan; the Port Authority of Denmark (APM); Stevedoring Services of America (SSA) of the United States; Hutchison Port Holdings of China; Dragados of Spain; International Transportation Services (ITS), Ports North America Inc. and Marine Terminal Co. (MTC Holdings) of the United States; Nippon Yusen Kaisha (NHK Line) of Japan and PSA International of Singapore. French, British and UAE companies also have voiced interest in the project according to its director, Rogelio Orillac." "In April 2001, Chinese President Jiang Zemin pre­sided over a 12-day mission to cement economic and trade ties, as well as attack what he called Washington’s “unipolar” scheme. His itinerary included Argentina, Uruguay, Brazil, Cuba, and Venezuela. Li Peng, chairman of the Standing Com­mittee of the People’s National Congress, followed up with more visits in November 2001. In Novem­ber 2004, President Hu Jintao flew to Argentina, Brazil, Chile, and Cuba, where he signed 39 bilat­eral agreements and announced $100 billion in investments over the next 10 years. In May of this year, Communist Party Chairman Jia Qinglin vis­ited Colombia, Mexico, Uruguay, and Cuba. Building on simple commercial agreements, China has advanced to economic assistance, direct investment, a few joint ventures, and military ties. When Argentina’s financial collapse rippled through South America’s Southern Cone, China quickly seized the chance to increase its stake in Argentina and Brazil, while U.S. investment declined by nearly half. Joint ventures include part­nerships with Great Dragon Telecom in Cuba as well as Colombia. China is partnering with Brazil to improve that country’s railways and establish a rail link to the Pacific to cut transportation costs of iron ore and soybeans. Chile’s congested port at Antofa­gasta may get a facelift thanks to the PRC." China is interested in potentially widening the Panama Canal to allow for larger Chinese ships to move goods from the Pacific to the Atlantic according to the Washington Times. President Bush in a recent trip to Panama announced US support for widening the canal as long as every country has "equal access". With China's large economic role in Panama, it must be considered a serious contender for replacing the US as the principal nation in the Panamanian relationship. China is working to reduce Taiwanese influence in the world through its economic ties in Latin America. "Of the 26 countries that still recognize Taiwan as a free-standing nation, half are found in Latin America or the Caribbean." "It is relevant to note that today China is the third largest manufacturer of automobiles in the world. Therefore, it is not surprising that according to the Washington Post, Beijing has estimated that by 2020 the country would need 600 million tons of crude oil annually." "China has displaced the United States as the world’s largest consumer of most industrial raw materials, including copper, aluminum, nickel, platinum and iron ore."
"In [China's] eagerness to secure access to the Latin American resources it so prizes, the PRC has skillfully wielded its economic 'soft power' to convince regional governments to amicably open up their countries to Chinese penetrations." "Chinese private sector direct investment in the region is significant: at $1.04 billion it constitutes more than a third of China’s overall direct investment worldwide. Furthermore, the PRC has approximately $1 billion in investments in Venezuelan oil production, and has promised much more to other countries in the region." "In 2004, China pledged $275 million for improvements to Argentina’s infrastructure, and, according to Poder magazine, it also offered Brazil '$8 billion for railways, $6 billion for low cost housing, $5 billion for hydrocarbons, $450 billion for communications, and $260 billion for satellites.'" "Chinese economic linkages with Latin America have been paralleled by a certain growth in the military relationship between the two geographical areas." "The meteoric deterioration of the quality of US regional engagement during the Otto Reich-Roger Noriega era of ideological supremacy, helped open the door for opportunistic PRC probes throughout the hemisphere. As it advanced its economic aims in Latin America, it also has carefully established active, if low intensity, military relations with the region’s armed forces." "China has had only one established direct instance of military linkage with the region as a result of sending 125 riot police to participate in the UN’s Haiti peacekeeping force." "Strengthened by cooperation agreements such as those signed between China, Brazil and Venezuela, bilateral military ties are increasing, although they remain minimal." "On a 2004 visit to China, Brazilian president Luiz Inacio 'Lula' da Silva sought an 'across the board' consolidation of strategic relations including trade, scientific, cultural and military ties, according to the China Daily newspaper." "Between 2003 and 2004, according to the PLA website, there were 15 visits to Latin American countries by PLA officials that were described as 'major military exchanges.'" "So far this year, a military delegation has visited Chile and Colombia in September, the director of the PLA’s General Political Department has traveled to Venezuela and Argentina, and 'goodwill visits' were made to Cuba and Mexico." "Chile has also established a close relationship which, according to Ellis' report, includes 'attendance by Chilean officers at the National Defense University of China,' and 'Chinese representation at the Chilean War College.'" "Venezuela and China also have tightened their military bonds in recent years. In August of 2005, Caracas purchased three military grade radar systems from Beijing." "As relations between Venezuela and the US have soured, China seems to have taken advantage, and Beijing could be close to establishing a potential master source to satisfy its oil thirst." "Peru and China also maintain active military exchanges, which according to the Peruvian Defense Ministry, are targeted primarily at scientific and technological cooperation. A 1998 agreement sent $1 million in military assistance from China to Peru, and similar accords have since followed." The Chinese, to grow their economy, require more natural resources than China has domestically. Securing metals and especially oil is vital to the long-term growth and modernization of the Chinese economy. China is seeking to obtain these supplies by increasing its good will with Latin American governments that have these resources, while minimizing Taiwan. Long-term Chinese goals will be to increase military contacts with these same nations to ultimately secure their economic interests. Panama is yet another example of China's ambitions in Latin America. The United States should wake up to what is going on in its historic "backyard" before it is too late. The Chinese, due to their policies, are currently more popular in Latin America than Americans are. It`s an interesting approach. I commonly see unexceptional views on the subject but yours it`s written in a pretty unusual fashion. Surely, I will revisit your website for additional info. Damn chinese and their Panama ideas...sure they are partnering to help others...yeah, that surely happens ! It's manufacturers claim this is the smallest and lightest AA and AAA battery charger in the world, and it can be used with both NiMH and NiCd rechargeable batteries. I am not sure the Catholic Church is spoiling for a fight with the Chinese in Latin America. Wizard and thus in front with the millions of Special Write-up Wizard users. There is no reason to pay the high price for an original Zenith watch when you can purchase Zenith Chronomaster Replica Watches from us with the same quality level. We are absolutely offering the best Zenith Class Replica Watches our there. We offer superior customer service, guaranteeing an email response for any of your questions or concerns within 3 hours and 7 days a week. We also guarantee our Zenith Defy Replica Watches quality as we use only the most reliable suppliers and we inspect and test each watch before we ship it out. You’ll also be very happy with our quick and speedy delivery. We promise you will be more than satisified with our Zenith El Primero Replica Watches. if you will sit down quietly, may alight upon you." You definitely done a great job here. You deserved to received for a recognition. China as called a Republic of china and panama we are say the leaves. and China Moves In from Insight on the panama.